The English garden tour continues today with the back and side gardens of this incredible property. The boxwood edging, planted containers and gravel and grass paths, planted to perfection, could easily be installed in any home or garden. Tour the English garden and grounds below to gather a few ideas. Enjoy! This arch of espalier apple trees leads to the back garden. The shady tunnel provides an enclosed entry to a very open garden view. The apple tunnel opens into this all white garden. I love this small round planter at the entry. White, green and gray fill the flower beds. Another magnificent view awaits around every corner. The gravel paths crunch under your feet near the house. I would love to walk this path with coffee every morning. Autumn blooming clematis and roses surround back entry door. The arch around the door is made from slate roofing tiles. 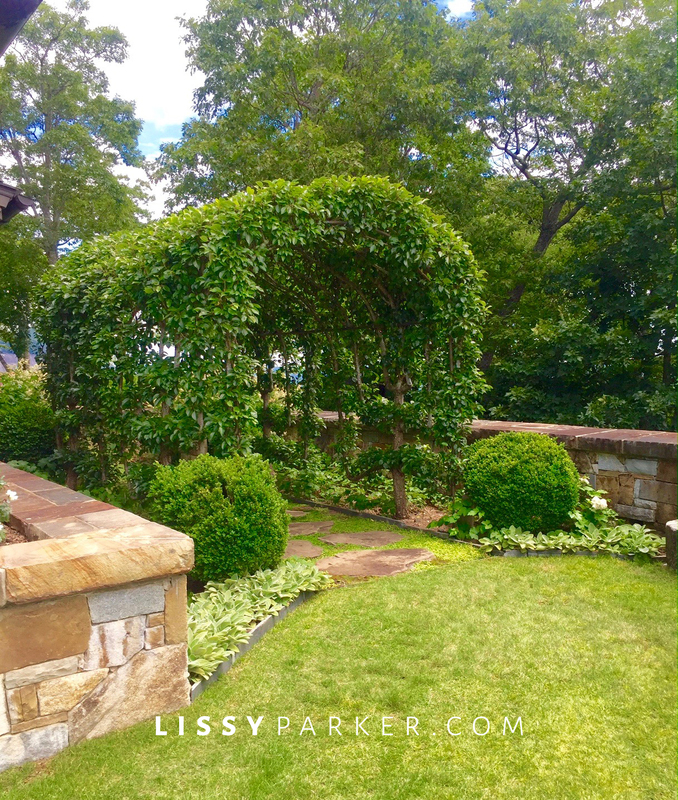 Knot gardens filled with boxwood flank the slate door—and another amazing view. The grassy lawn leads down to a newly cleared area—another garden to come? This old well head is the focal point of the side porch garden. The slate porch and stone fireplace are a wonderful gathering spot. The stone arch leads to the charming guest house. Look back from the guest house to the main house and stone well garden. Details make the difference—what a charming antiqued lantern. Enjoy the welcoming entrance to the guest house—yes, please! I remember reading about this home and the gardens when it was on the market a few years back. The beauty and magnificence is indescribable. I appreciate your post sharing the gardens in bloom. As I meandered these paths with you I wondered how one could dwell amongst all of this and then part with it. The views beyond the gardens are totally mesmerizing Lissy. Victoria, I agree with you—I could never leave!